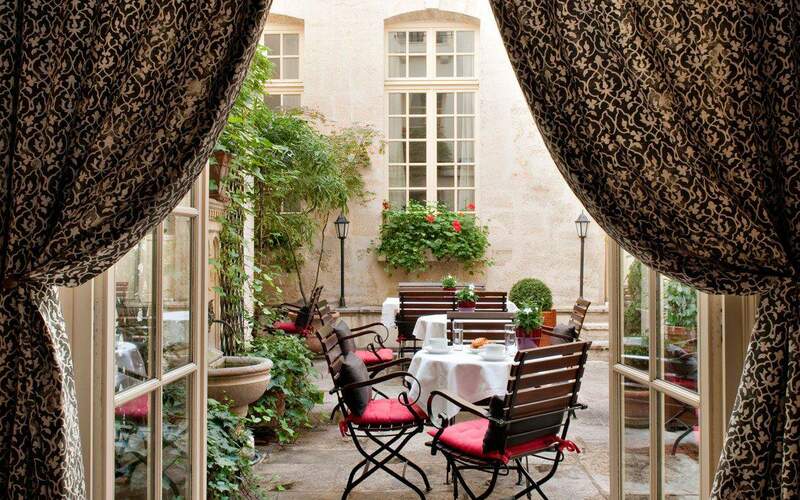 Outdoor cafe in paris – Our top selection! For a taste of the Basque region in the French capital on a 200m² terrace and with a great atmosphere, Au Trinquet is your ticket. Thursday evening is terrace apero evening, so shimmy on down to join flocks of Parisians for their after-work wind-down and enjoy some tasty tapas and cool beer. Located just next to some basque pelota courts (you’re going to have to google that one guys), a post weekend kick about drink on the terrace is also a good idea, in our expert opinion. Au Trinquet hits the top spot on our list of the best outdoor cafe in Paris. To enjoy a spot of sunshine whilst being serenaded with easy jazz on a terrace in the heart of Paris’ left bank, Le Café Laurent is your ticket. Situated inside Hotel d’Aubusson, hidden from the hustle and bustle of the Parisian streets, Le Café Laurent is the perfect place to go and relax whilst sipping on a glass of champagne or tasty cocktail. Their service is also mention worthy, with a team of welcoming staff, this terrace is a firm INSIDR favourite as part of the best outdoor cafe in Paris. You can find a terrace every couple of metres on the busy Parisian boulevards, but be warned, you have precisely 3mm moving room and the noise pollution to go with it. If you are looking for somewhere calmer, Au fond du jardin is the terrace for you. Hidden behind a restaurant on rue Pelleport and found (as its name implies) at the bottom of a garden, this adorable secret hideout is the perfect brunching spot or ideal for that early evening glass of wine. 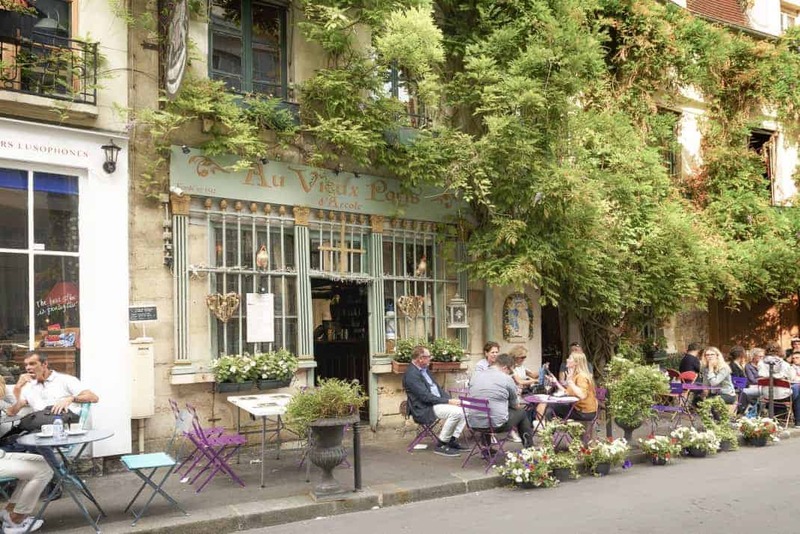 One of our favourite outdoor cafe in Paris. 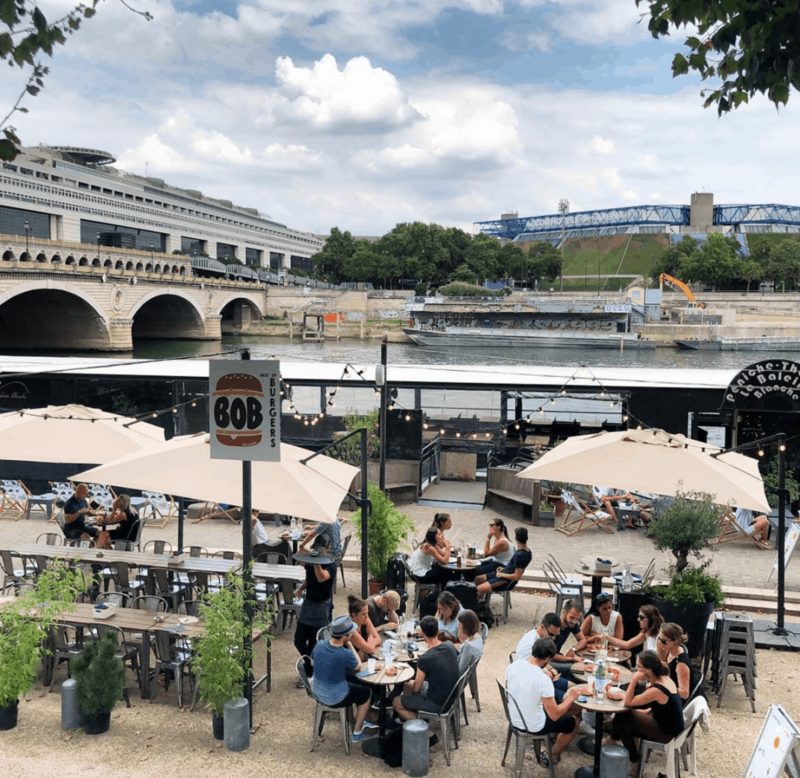 Waterfront spot + good beer + terrace is a winning formula; a fomula expertly employed at Paname Brewing Company – which ranks really really high on our list of the best outdoor cafe in Paris. If you take a stroll beside the canal in the up-and-coming area of Jaurès, past the groups of friends picnicking and playing pétanque as the sun sets, you will come across this pub style brewery. 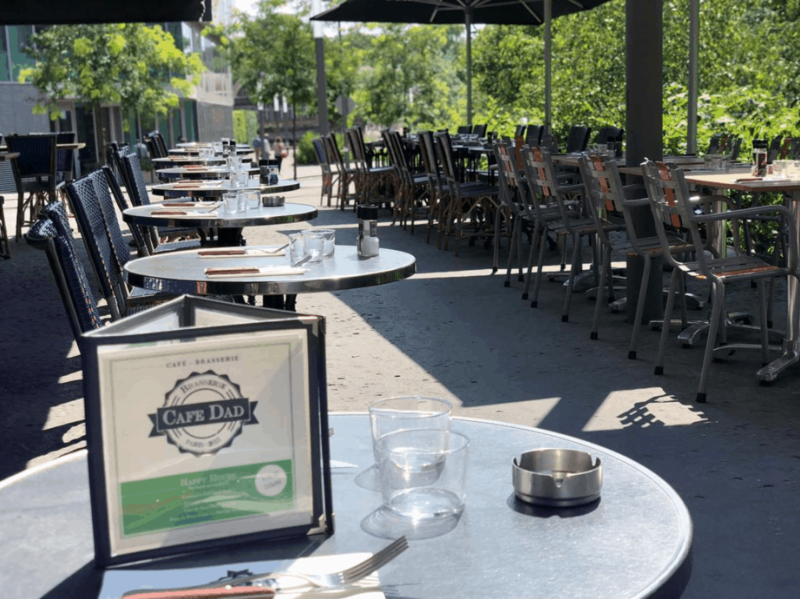 Order one of their quality Parisian craft beers and pull up a chair on their large terrace, overlooking the Bassin de la Villette as the sun goes down. If you don’t know if you want to be an exotic garden, music venue, bar or boat… be all of them! That’s exactly what La Péniche Baleine Blanche is going for, and they are pulling it off with style. PLUS they have a terrace, meaning you can enjoy their live concerts, in a garden, on a boat, on the Seine… what more could you want out of an outdoor cafe in Paris? Far from cramped Parisian terraced cafés with their signature tiny round tables, café Dad resembles a trendy, yet friendly London bar. Perfect for happy hour tapas and a beer in the sun, or a late night hangout spot to meet with friends over cocktails, Café Dad’s terrace is a sure summer stop hit. Located in a converted convent in the 10th arrondissement, Café A is a popular weekend hangout for Parisians. When the weather is good you’re guaranteed a good atmosphere if you head to their terrace which is a pleasant natural setting for an evening of socialising. Their food is nothing to rave about, but the location and setting is worth the trip! Definitely one of our go-to outdoor cafe in Paris. The photo above doesn’t do this place justice at all. But just trust us and follow @larecyclerie on Instagram! 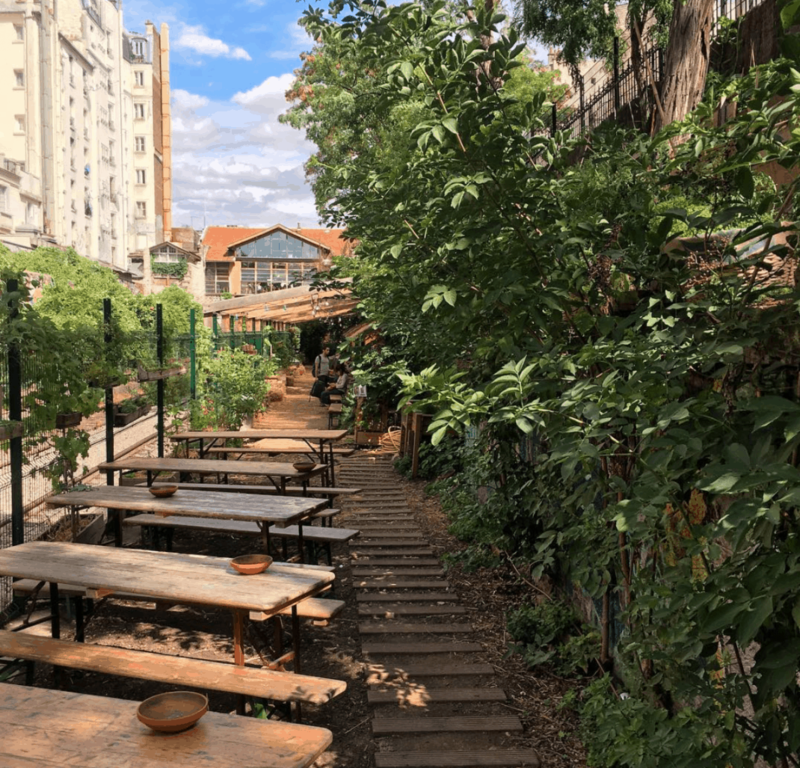 Located in the rough and ready 18th arrondissement, this restaurant has a terrace with a twist; stretching along the abandoned train tracks, its rustic appearance is an extension of the informal, recycled interior. La REcyclerie is a fun place to grab a coffee in the sun with a relaxed atmosphere. Heads up, it gets very busy around midday during the weekends, so to avoid the queues and be guaranteed a seat on the terrace, a week-day visit would be best! Definitely a great outdoor cafe in Paris. After the success of their two rooftop terraces, the Perchoir comrades have opened their third address. 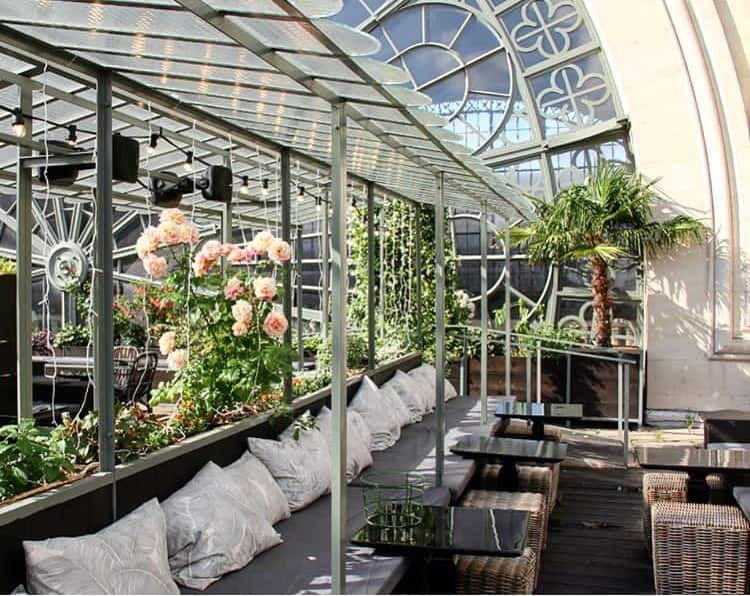 Staying true to their trendy tendency of finding quirky locations to observe the city skyline, le Perchoir is located on the roof of the well know train station, Gare de L’Est, and decorated in a tasteful neo-industrial style. Their terrace is decked out with large communal tables adorned with big parasols for some welcome shade from the Parisian sun. Open for a limited time only, this bar should be on your summer Paris bucket list! It is definitely one of the best outdoor cafe in Paris. An oasis of green and one of the best outdoor cafe in Paris, the terrace at le Mini Palais is hidden in the heart of the extravagant Petit Palais with beautiful arches that allow you to view the garden. The food is pricey and the quality debatable, but the setting is idyllic, so for an afternoon cup of coffee or glass of wine in the centre of Paris, this is a note-worthy address.